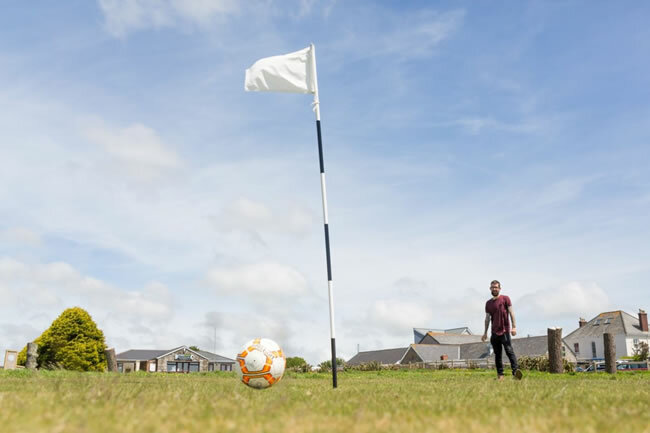 Footgolf at Wheal Dream is an exquisite delight with incredible views and part of a wider offering. The 18-hole, expertly designed course is in Wendron, Cornwall. The South West is famous for its footgolfing reputation, but Wheal Dream Footgolf only adds to that. This is a family friendly Footgolf course that offers a mix of challenge and scope. Available every day of the week, with tee off times until 7pm, you can be sure to fit in a game or two. Don’t miss out on the other opportunities at Wheal Dreams. For a spot of more fun then try your foot at zorb Football, refuel in the wonderful restaurant (with divine Sunday roasts and an outdoor play area), or make your visit in to a stay. At Wheel Dreams you can stay in a lodge or glamping pod. This course is an 18 hole course. Its well designed, with numerous rustic obstacles on every hole including logs, tyres, a bridge over a ditch, teeing off from a high up mound, kicking the ball over and under bars, between posts, around items like a boat, and finishing by kicking it at a wooden engine house with openings that score different points! Giving this course a good variety. Some of the holes seem very difficult to get a par score on! The course is maintained well and the chap running it is helpful. This course is open all year round (I think - weather dependent) which is good for availability. Plenty of free parking is available on site.